Funeral service for the late Germaine Garpah Verdier will be held on Friday December 13, 2013 at 11: am at Vilunda kyrkan in Upplands Väsby Sweden. DIRECTION:|When coming from Stockholm city, take the train toward Märsta or Uppsala C ;Sit at the front of the train and get off at Upplands Väsby station. Meanwhile, Liberians and Friends of Liberia residing in Europe and worldwide are to make financial towards the funeral arrangement of our fallen colleague. Individuals are urged to make a MINIMUM payment of TEN EUROS (10 Euros) and whatever their heart can afford especially his personal friends. Deadline is first week of December 2013. The Late Bro. Germaine Garkpah Verdier was a Peace Ambassador and worked assiduously to bring Liberians together all over the world. 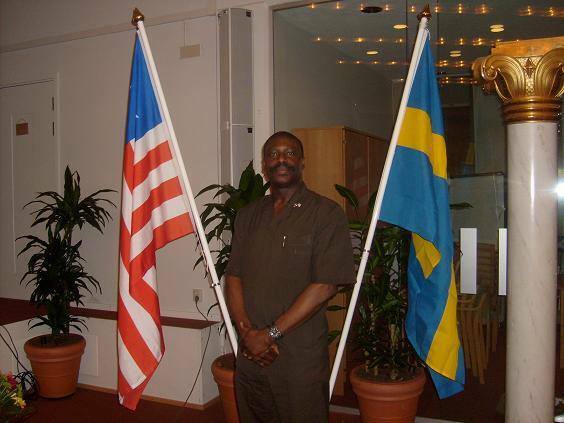 We have lost a great friend and brother, and Liberia has lost a dear son. We pray that Germaine’s death will UNITE us as one people and work together as in Unity, there is Strength!!! Please contribute generously to give our fallen a very decent “send off” befitting his good work and kindness shown to all Liberians. Thanks for your kindness and season’s Greetings on behalf of everyone at EFLA. Rest in peace Germaine. You were a true Ambassador of peace. Rest in peace and fair thee well you great son of Africa . May the Good Lord God Rest your soul in eternal peace, and may He be our comfort and dry our tears as we continue mourning you Jammie.